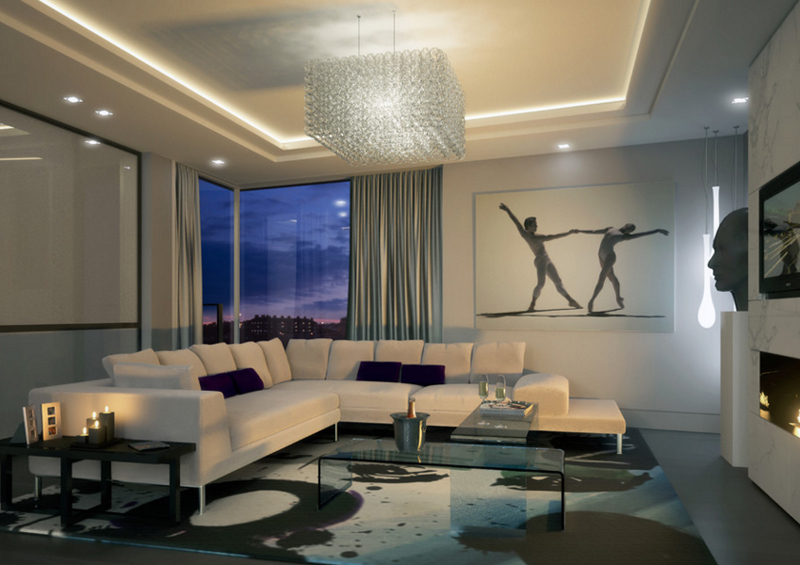 Your living room will look more sophisticated with a crystal chandelier. 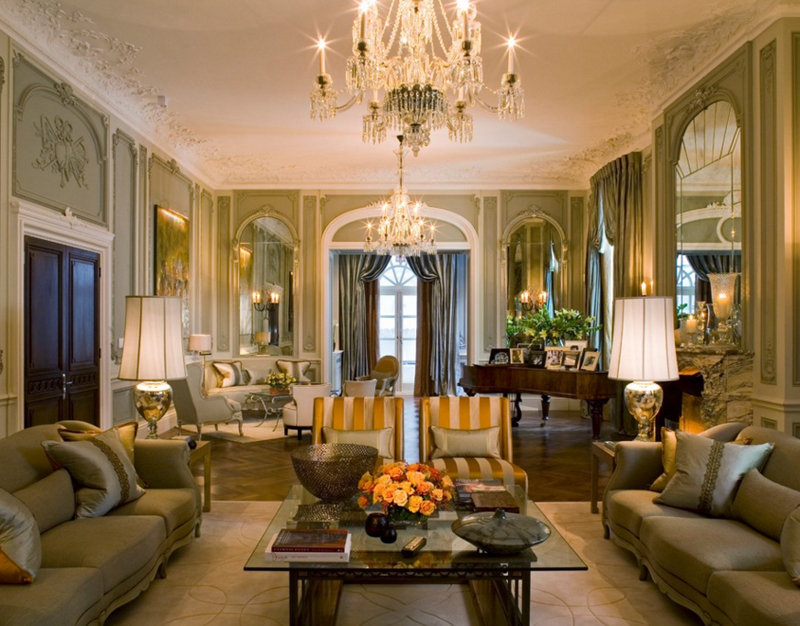 When we talk about fancy lighting fixtures – we know people are talking about chandeliers; most chandeliers that we see and associate with luxury, which is common in expensive and well-designed homes are made with crystals – these are either the real deal or mere representations of those expensive ones; sometimes even high-class plastic is used for these chandeliers. Below is a list of 23 Stunning Crystal Chandeliers in the Living Room that we think would really amuse you; not only are they beautiful and really well done but they too are fancy which made the living rooms they are in much more pleasing to the eyes and really fantastic! Without much further ado, check out the list that we have created for you guys! This fancy living space is using an open floor plan which allows us to see the entire home in just one sweeping of the eyes. Whenever I see this type of planning, I think it is ideal for homes that have kids since parents are able to see the children even when they are in the kitchen. 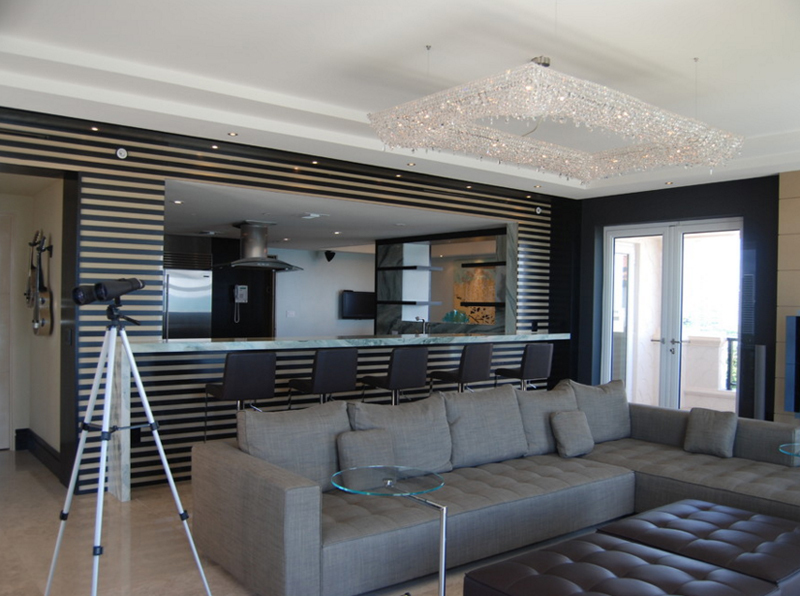 Notice that there are two similar chandeliers that is directly above the living area and the dining area. CID Interieur sure has created a wonderful space for the home owners to indulge in – the sectional paired with that rectangular glass coffee tables blend well with the decorations in this space – note how the cube chandelier complement well with the square carpet. Fancy a circular chandelier? Well, this example might be for you. We somehow imagine how a chandelier should look like but when you think about it, designers are innovating more and more to cater to the clamoring want and needs of buyers everywhere. Take a look at this glamorous piece of chandelier! Its translucent design radiates more beauty which evidently makes this contemporary living room more classy and fabulous! 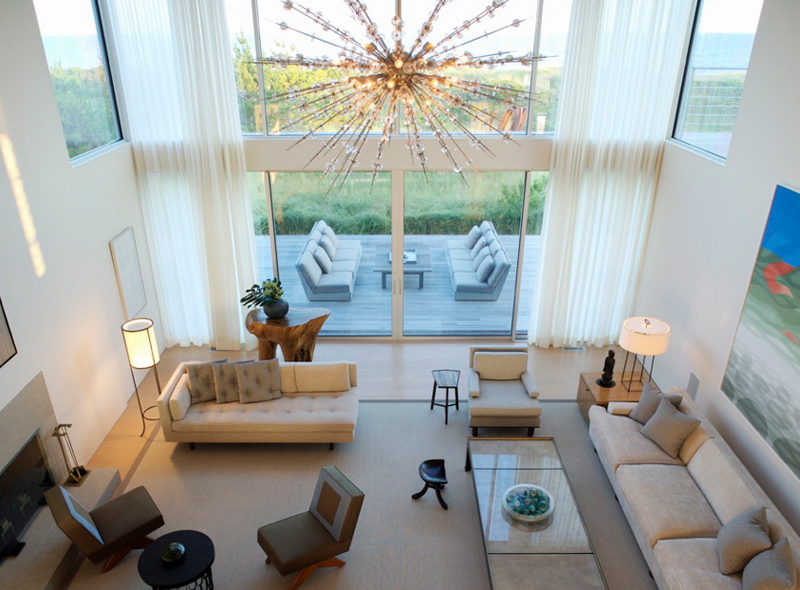 Check out the unique chandelier added to this living room to create lighting and design to the space. Aside from the chandelier, I personally love the brick wall and the recessed ceiling. What do you think about this chandelier shaped like a rectangle that glitter and shine brightly on the ceiling? 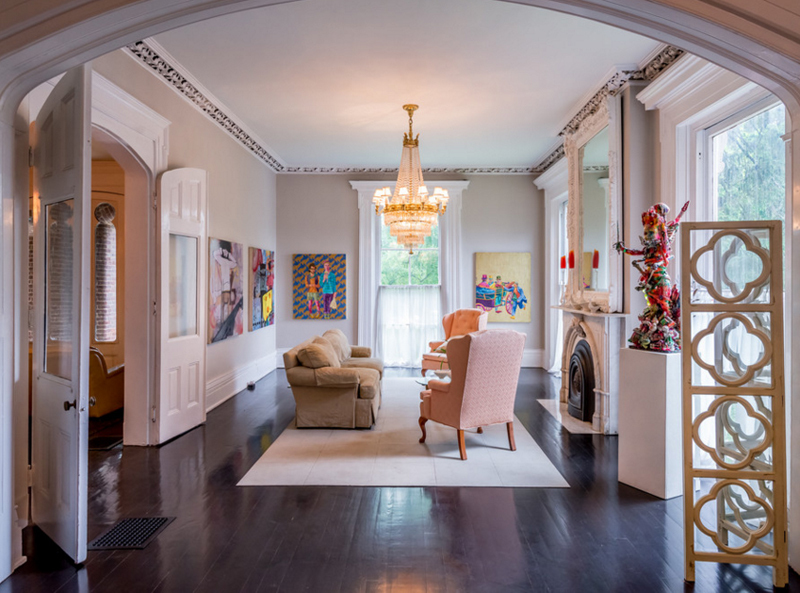 If I was given the chance to design this space, I would either paint the ceiling a different shade or choose a chandelier with a hint of color because the combo they have not – even when already beautiful, would have been prettier if contrasting colors prevailed. This is a ravishing piece of chandelier – the design and technique used in this one sure is outstanding and really fascinating. The fact that this space has a high ceiling, the arrangement of the living space is really pleasing. Shabby chic and white washed walls – two of the things that make this space stand out in this list. I know that this space is contemporary and most shabby spaces are eclectic, the chic-ness just adds more beauty to this space. I like the classic look of this chandelier paired with its rustiness – adding a contrasting color like gold or bronze in translucent create a more dramatic effect – but of course, most often than not, consumers just choose them from stores because customizing lighting fixtures is expensive. Stunning pieces of furniture, great color combination and a glorious chandelier – what more can a home owner ask for? 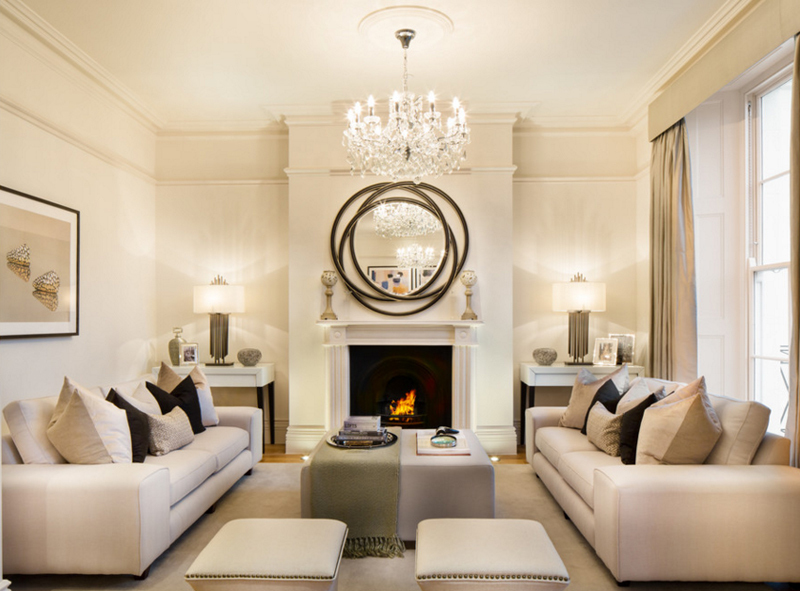 This symmetrical living room is so gorgeous I can’t breathe! Now this is one charming living room, right? The sofa and arm chairs look really comfortable and the drapes are just wonderful – it completes the look that this space wanted to achieve – fab, fashionable and really homey! If you notice just how much the chandelier complements the look of this space. Do you see the chandelier? It looks like a crown right? It’s really pretty and somehow complements well with the color combination that this home has – the green drapes match the green carpet and somehow contrasts with the dark-colored seating paired with colorful pillows. The lovely chandelier creates a Victorian feel to this tiny living space – the arm chairs and the paintings on the wall looks cool because of the pop color seen here and there; don’t know if we can call it Vic-Pop as in Victorian-Pop. Right? Another drum-type chandelier that showcases a modern approach to chandelier design. The design of the windows in this house welcomes light to this home and serves as a passive way of promoting Green Architecture. The neutral shades used in this space are quite calming – from the doors to the ceiling, the carpet and even in the sectional – the colors may seem simple, but it sure looks pretty neat. 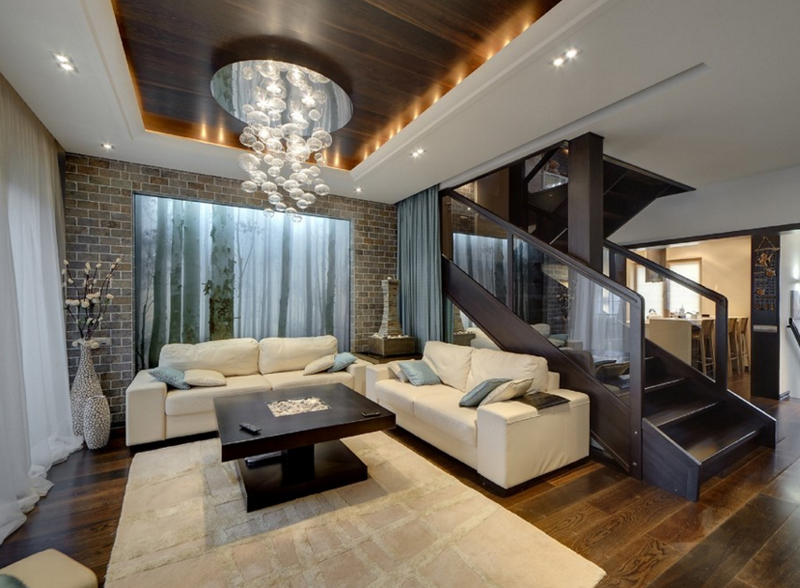 The wonderful chandelier seem enough for the height of this living room. 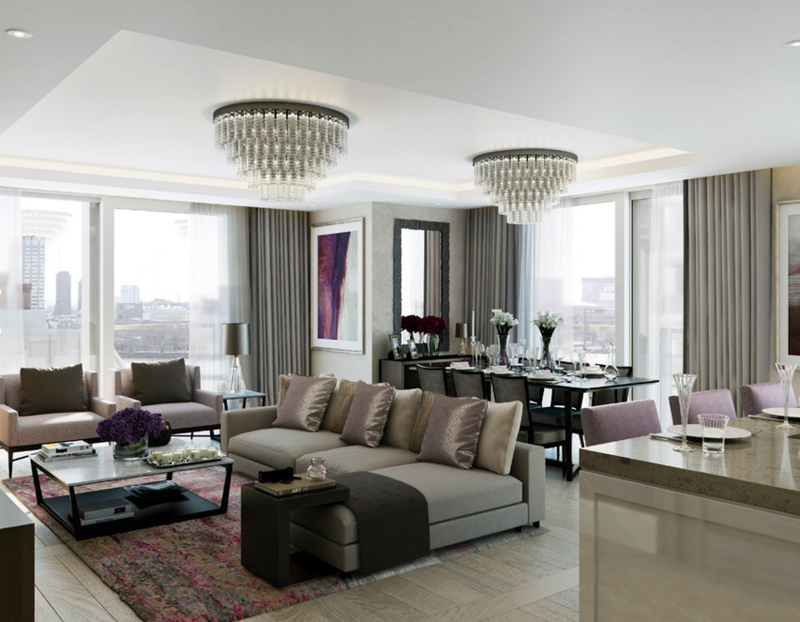 The Mayfair residence’s living room sure looks grand! From the furniture to the decorations and furnishing – pure bliss! 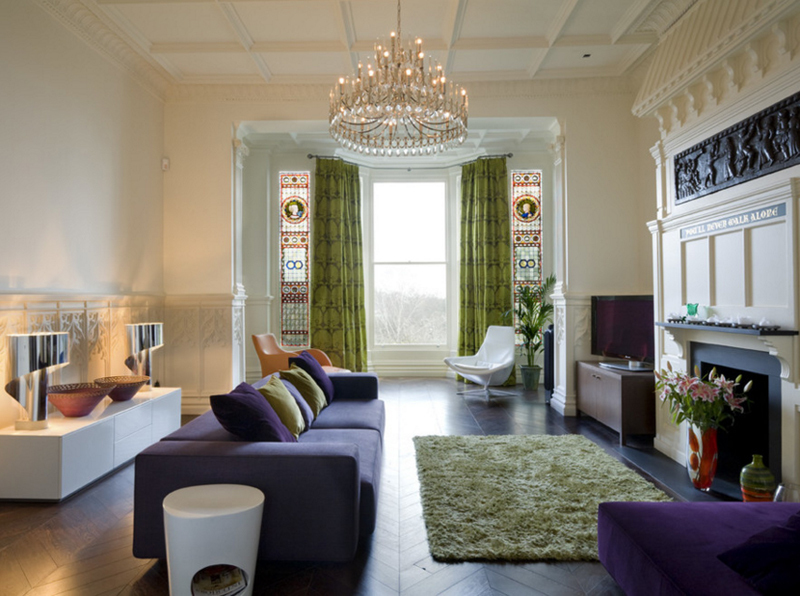 When you look at the chandeliers in this space you’d think that they’re really outstanding! 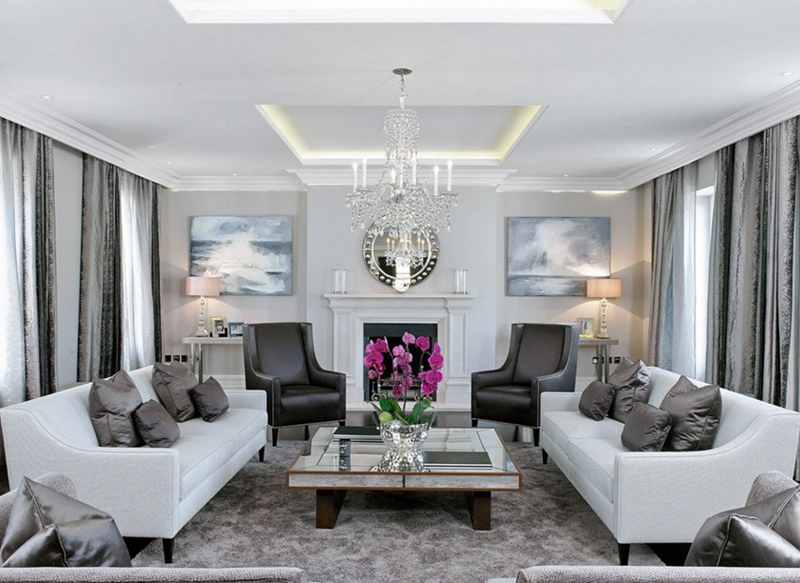 Yiangou Architects did a great job in completing this living room in Hertfordshire. 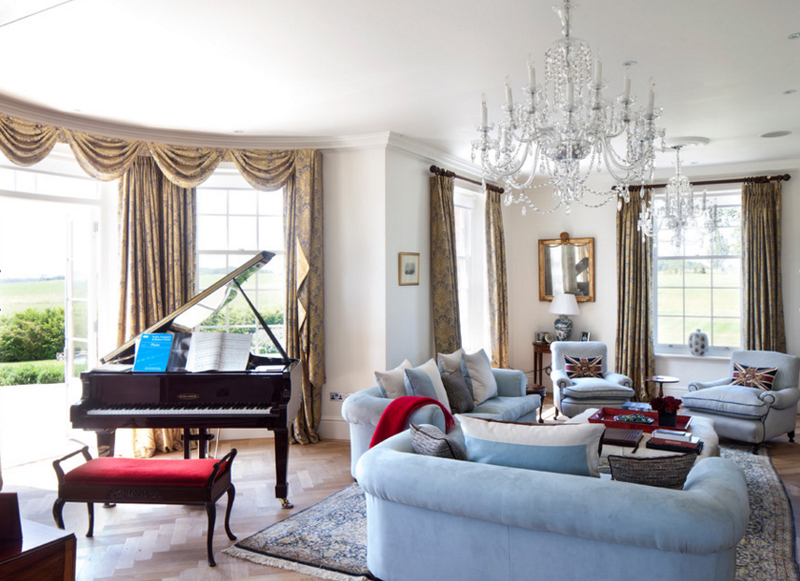 The blues of the seats and the marvelous chandeliers, with the grand piano and the perfect curtains – what more can I say about this stunning space! Perfection! 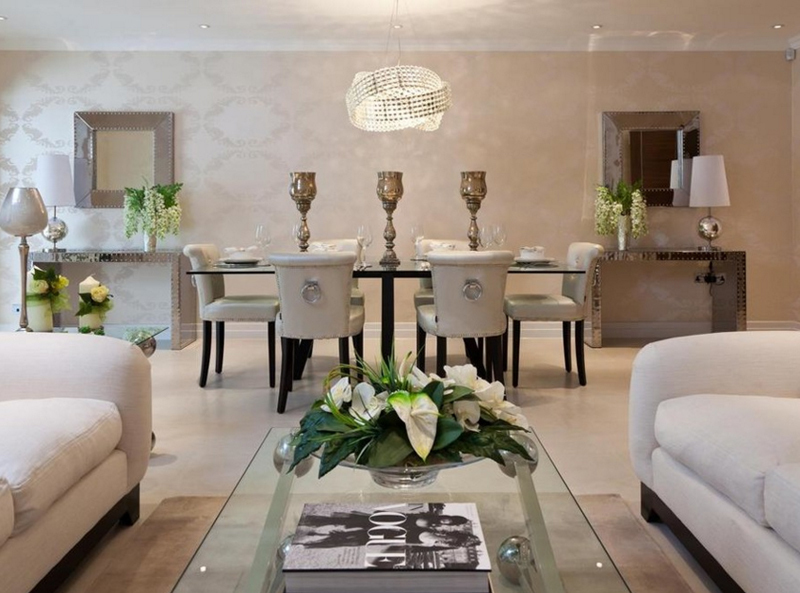 I have seen quite a lot of photos of London homes and I can truly say that they are the epitome of glamour and class. Architects and designers from London make sure that their designs and the quality of their designs are loved not only by the home owners but the people like us who sees their works. Will you look at that! Another symmetrical living room that makes use of the entire square meter of the room to make sure that every bit of the space is utilized and enjoyed by the clients. The chandelier in this home is really dreamy! 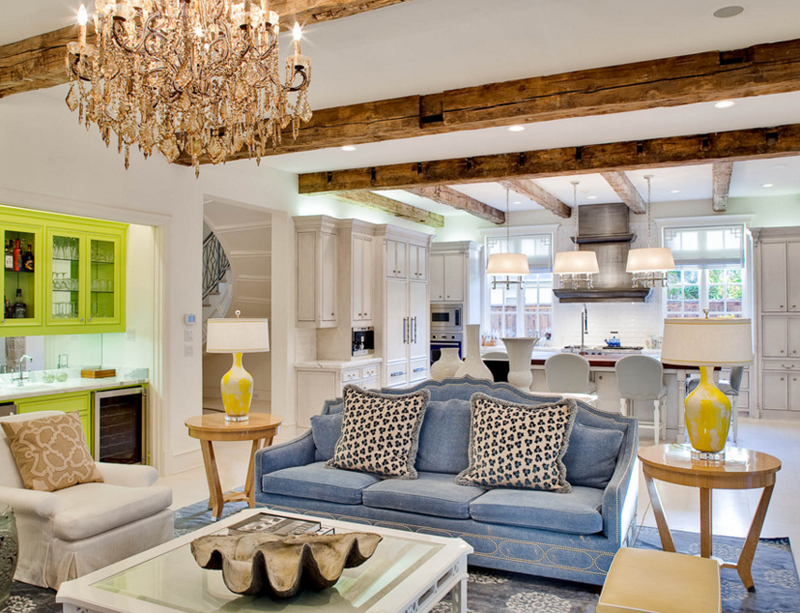 The exposed beams in this Park City created by Mark Molthan complement the wooden furniture and decors in this space. The wonderful work done on the chandelier is something I personally like. It looks like sun and feels like rain – wow! Where’d I get that? Haha. White and silver grays paired to create a regal and classic look. 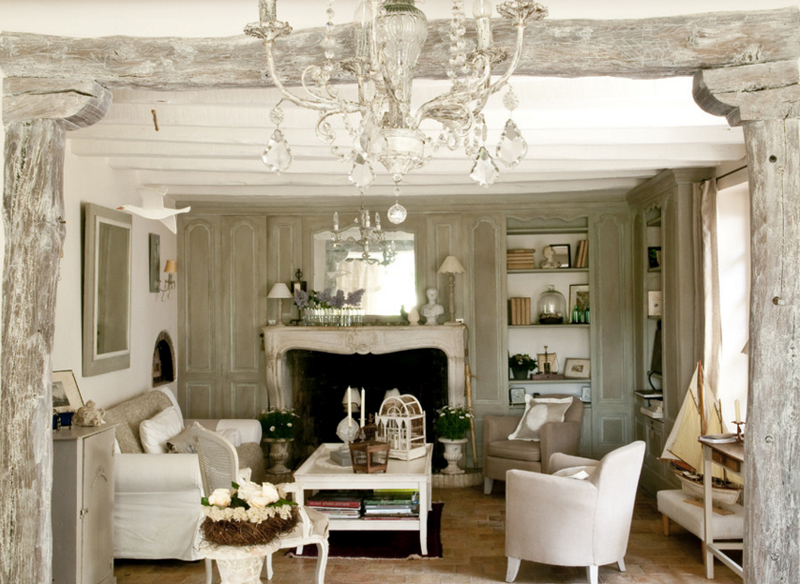 This color combination always looks fascinating for me – and then when the decorator added a stunning chandelier — voila! Perfection! Aside from the color combination of this living space – the furniture and decor of this space is quite stunning – very modern and quite promising I might say. I would like to believe that this space is owned by a person who loves and appreciated grey matched with glamour! Last on this list is a rustic-inspired chandelier that complements the contemporary setting of Sunset Plaza. The velvety material of the sofas, arm chairs and pillows in this space is quite a charm. 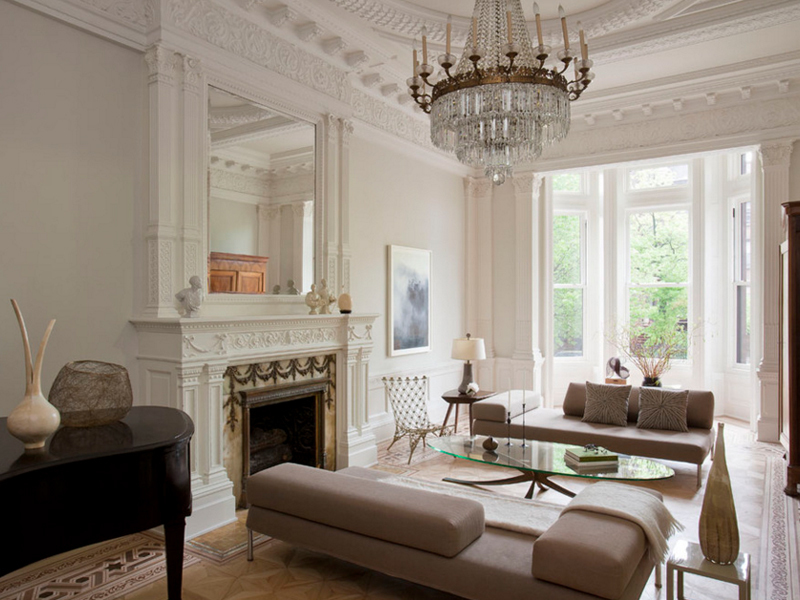 Adding a grand piano to this living room created a more dramatic effect. Now that was one awesome list! From classy living rooms to those unique and designer chandeliers! What more can one interior fanatic asks for? Lighting fixtures like the ones in this list are some of the designs you might want to check out before purchasing one for your homes. And if by chance, you can also add crystal chandeliers to the bedroom too.